If you write your unit tests using Visual Studio, then you know how quickly those pesky "TestResults" folders can eat up precious disk space over time. Assuming all of your code is collocated in the same parent directory, replace "C:\TFS" with your parent directory. Error Handling when deleting folders and files. OSQL accepts ANSI and Unicode encoded files, BUT I tried opening my file with notepad++ changed the encoding to UTF-8 and I got similar errors. 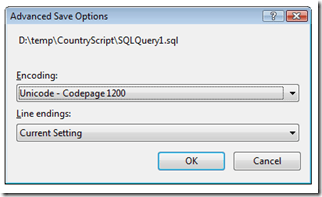 MS SQL Server’s osql utility (SQL Server 2000) is deprecated. 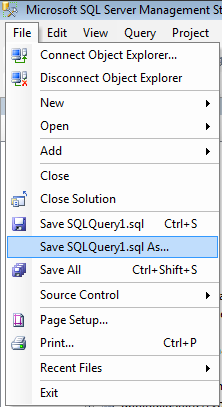 I have been trying to run MS SQL Server’s osql utility (SQL Server 2000) to insert some default data. 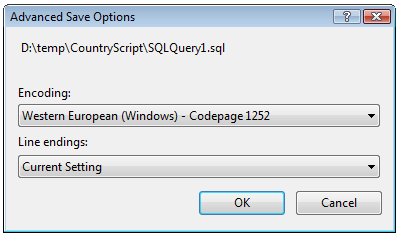 My SQLServer’s target database collation is Croatian_CI_AS. After some time I’ve realized a few things about the ways in which you can save the input file. Using Notepad++ as my editor I thought that formatting a file as UTF-8 would cause everything to be wonderful and magically work. Not so. In fact, osql will not even read the UTF-8 encoded file (this was a real surprise)! That was a weird thing but I kept on getting this error message about first line and some weird character displayed there. Turns out that osql accepts unicode or ANSI encoded files (and there’s no way to control the input file encoding from the command line so we’re stuck with that … which is not that bad after all). So, no.1: don’t format your input file for osql as UTF-8. That’s a different animal from a unicode encoded file. Notepad++ offers several formatting options. Turns out that UCS-2 Little Endian is the wizard. For those interested, read on UCS-2 on wikipedia. I just realized it was actually a 16-bit Unicode encoding. Just looking at it in the list of encodings in Notepad++ didn’t ring bells. I’m not sure why UCS-2 Big Endian encoding does not play nice (I get gibberish for most of my special characters). Formatting a file as ANSI in Notepad++ and then running through osql was a bit of a surprise that it did not work (special characters like diacritics became gibberish, although osql did execute everything). I even changed my Windows code page to Croatian in hope that it will all somehow sort itself out but it didn’t. From what I can tell,osql will read the ANSI encoded file as probably English Latin encoding and loose the special characters in the process. 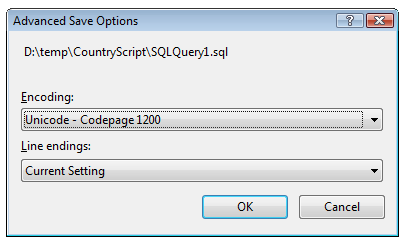 osql.exe is a great application for running sql scripts in a batch. I use a batch file to execute multiple sql scripts that I use to rebuild my current application database from scratch. When developing a brand new application, deploying a database in this way makes it really easy to recreate the database just like it will be created on Day 1 when you build out the Production environment. This requires scripting out all of your sql objects and then also having a way to execute all of those sql scripts easily. That is where osql.exe comes in handy. But osql.exe does have one issue that I ran into this week where it does not like UTF-8 (codepage 65001) or UTF-7 (codepage 65000) encoded files. And sometimes you need to include unicode characters in your sql scripts. At first I thought osql just did not support unicode but that is not the case… it just does not like the UTF-8 or UTF-7 encoding. Incorrect syntax near ‘ ‘. Saving the same file with Unicode Encoding (codepage 1200) will work just fine. 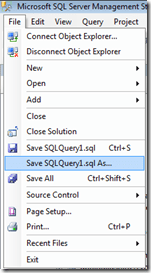 Here is how to save sql scripts in Microsoft SQL Server Management Studio with a particular encoding (you can also use this method to see what type of encoding the file is saved in in the first place). One other thing to note is that Visual Studio has this same type of Save As… functionality. Then when the Save File As dialog appears you will see a little black arrow (inverted triangle) as part of the Save button. Clicking the just the inverted triangle portion of the button will give you a menu. Choosing the Save with Encoding… option will then present you with an Advanced Save Options dialog. Here is where you can specify the encoding to use for the file. 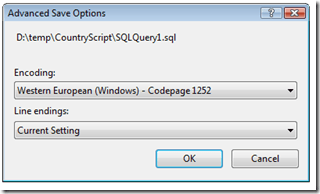 For osql.exe make sure you specify either Western European (Windows) – Codepage 1252 or Unicode – Codepage 1200. Do not select UTF-8 (codepage 65001) or UTF-7 (codepage 65000) or osql.exe will give errors when trying to parse the file. These commands should work in Internet Explorer 7 on XP or on Windows Vista.